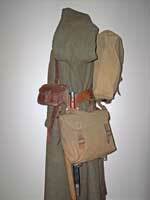 In Marching Order, the soldier carried his entire kit including the Pack. These views show the complete I.E. Patt. '14 as worn in Marching Order. Most of the components in this set are American made, except for the Pack, Helve carrier, Water bottle carrier, and one Pack strap. It gives a good impression of the original London Brown, some pieces being unused, and nearly all surviving dark polish or greasing. 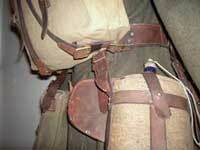 The Pack and Haversack are both first issue, having all leather tabs and & chapes. The first detail picture illustrates the correct method of connecting the Pack and Pack straps to the Waist belt. 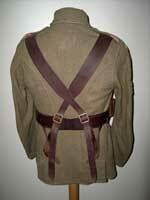 The intention, as with the 1908 Pattern equipment, was that the Belt would take the load of the pack (and not the shoulders) thus distributing the weight evenly. In theory, the 2-inch chapes were only to stop the Pack falling backwards, and indeed should bear no weight at all, but early reports on Pattern 14 noted the tendency of the 2-inch leather chapes to tear off under load. Of course, theory is fine, but the set had to be finely adjusted to achieve this. 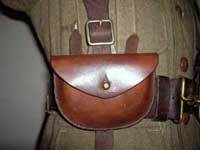 Likewise, 'Parade smart' also over-ruled practicality at times - war or not - The pack sitting high on the back was deemed to give a far better appearance. Much more important to a CSM, perhaps, but negating one of the most important design principles. 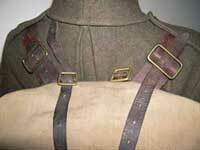 The last detail shows alternate approved methods of attaching the Pack straps - either to the 1-inch buckles on the top of the Pack, as on the left, or to the 2-inch Brace buckles shown on the right. From the Chris Pollendine Collection, photos © Chris Pollendine 2011. I.E. Patt. 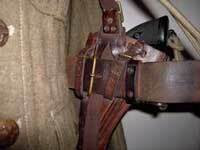 '14 Brace attachments were used only by "...unarmed units", primarily the R.A.M.C.. The set below illustrates an R.A.M.C .orderly, c. 1917 - 18, with Patt. '14 equipment including Brace attachments, a 3rd issue Patt. 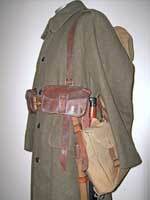 '14 Pack, and what appears to be the bag for a PH hood, used as a Shell dressing bag, 3rd pattern Brodie complete with original cover with RAMC badge, early simplified Greatcoat (c. 1915 -16, still retaining cuffs, partly hand sewn), and 1917 dated b5 boots. From the Chris Pollendine Collection, photos © Chris Pollendine 2010. Just as was done earlier with W.E. Patt. 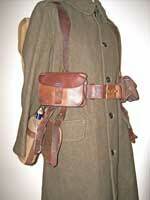 '08, additional items were added to the pattern to provide a Pistol Order, "for pipers and range takers". 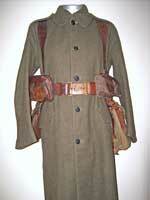 L. of C. 17177, dated 21 Jan 1915 / 8 March 1915, added the Case, pistol, Webley, with "V"-attachment and buckle, and Pouches, ammunition, pistol, Webley, with "V"-attachment and buckle, both shown in the set below. 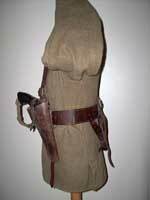 The L. of C. also added Loops, dirk, "for Highland Regiments", replacing the Loops, dirk, brown (Mark 1), which were declared obsolescent by L. of C. 17178 on 19 April, 1915. 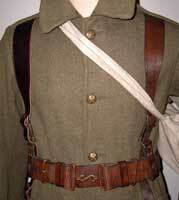 The Belt in this set is marked "London" and dated 1915, although the maker's mark is indistinct. The rear of the Belt shows all four Brace ends intact. 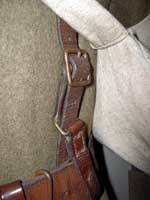 These were largely redundant when the Belt was used in Pistol Order, and are often seen cut off in use. There was no Patt. '14 equivalent of the Patt. '08 Belt, waist, special. 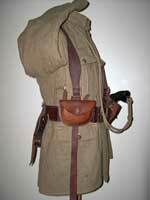 The Pouch, ammunition, pistol has none of the correct features, being too wide, in un-grained leather and with no strap tidy loops. It appears to be a well-made, but bad modern copy, of something that did not exist and artificially aged, purporting to be a Patt. '14 item. The replication is so way off-beam, that there is an argument that it is therefore a genuine pouch, which simply borrows Patt. '14 methodology, perhaps for use on Sam Browne, on the left side of the belt. Whatever the case, it is not Patt. '14. The Pistol case was made by H.G. & R., and is also 1915 dated. All components are British made. Whilst much Patt. '14 was U.S. made, neither the Pistol case nor the Ammunition pouch seem to have been commonly produced in the U.S.. From the Chris Pollendine Collection, photos © Chris Pollendine 2010. Paul Hannon came up with this spectacular original posed photograph. Here's what he has to say about it: "Rifleman Dawson, of the 2/9th (County of London) Battalion (Queen Victoria's Rifles). Cracking photo showing fighting order. 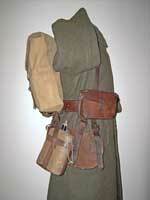 Rolled groundsheet attached to the back of the Waist belt, usually using a Pack support strap, sandbags folded between the body and the Haversack to cushion the entrenching tool, in this case a pick. Note how these were placed. The GS shovel was carried in the same manner. 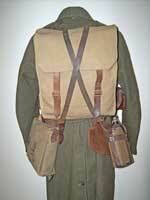 'Envelope' type Mess tin cover, and what might be a rolled signalling panel under the flap of the Haversack. 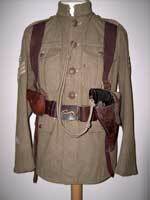 Rifleman Dawson was part of No 7 Assault Group of this Battalion. 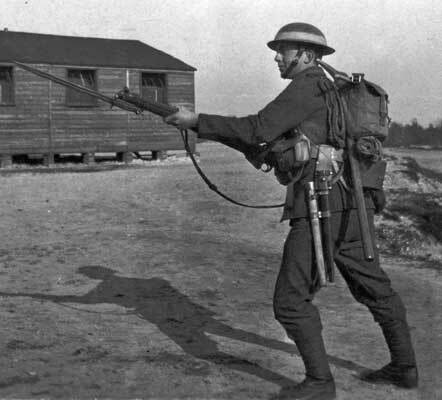 The Battalion was at Aldershot for assault training in the run-up to embarking for France, where it landed in February 1917. No 7 group had evidently won a training competition and posed for some celebration photos. 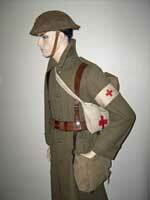 An extremely well turned out soldier."